Calculate the wavelength, frequency and energy of a photon of electromagnetic radiation. Determine the energy level transition of an electron for a particular wavelength of electromagnetic radiation. Correlate emission spectra lines of the hydrogen atom to their respective energy-level transitions. Describe the arrangement of electrons in an atom using orbital diagrams, electron configuration notation, and Lewis structures. Explain the periodic trends of the main group elements including atomic and ionic radii, ionization energies, and electron affinities. Explain the role of electron shielding and effective nuclear charge in determining the atomic and ionic radii, ionization energy, and electron affinities of an atom or ion. Describe to correlation between the principle quantum number of the valence electrons and the atomic and ionic radii, ionization energy, and electron affinities of an atom or ion. Use Lewis structures to illustrate the structure, shape, and characteristics of polyatomic ions, ionic and molecular compounds. 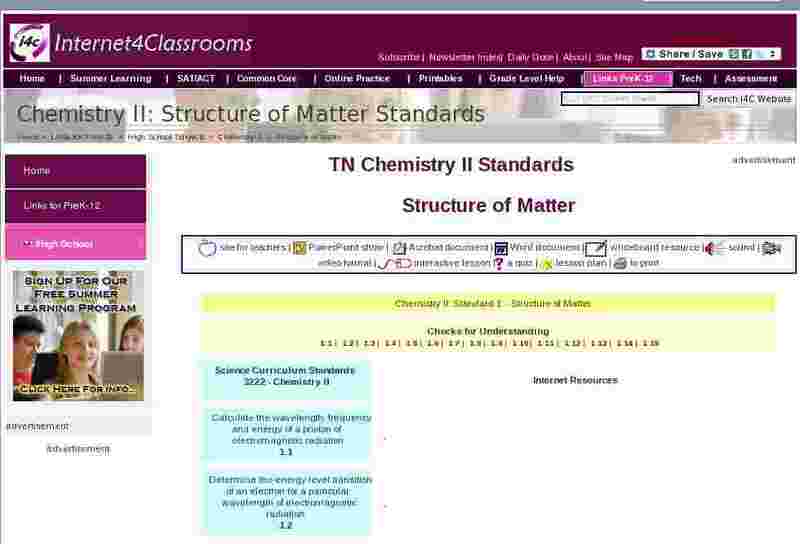 Illustrate the shape of molecular compounds using VSEPR theory. Determine the polarity of a molecular compound by examining its bond dipoles and shape. Apply Lewis structures and formal charge analysis to determine if a compound or polyatomic ion forms resonance structures. Explain the formation of hybridized bond orbitals in molecular compounds using VSEPR and valence bond theory. Illustrate how sigma and pi bonds form between atoms in a molecular compound. Draw the basic functional groups found in organic molecules. Draw the structural formulas of simple organic molecules.